In January 2006 a man tried to break Marcel Duchamp’s Fountain sculpture with a small hammer. The sculpted foot of Michelangelo’s David was damaged in 1991 by a purportedly mentally ill artist. Each such incident confronts us with the unsettling dynamic between destruction and art. Renowned art historian Dario Gamboni is the first to tackle this weighty issue in depth. Starting with the sweeping obliteration of architecture and art under the Communist regimes of the Soviet Union and Eastern Bloc, Gamboni investigates other instances of destruction around the globe, uncovering a surprisingly widespread phenomenon. 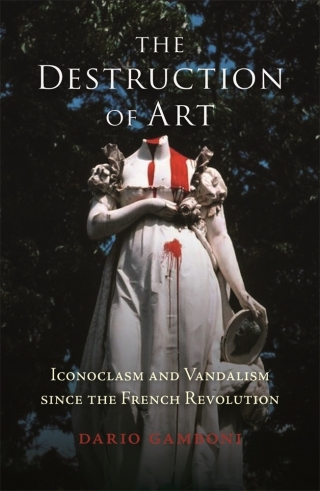 As he demonstrates through analyses of nineteenth- and twentieth-century incidents in the u.s. and Europe, a complex relationship exists between the evolution of modern art and a long history of iconoclasm. Gamboni probes the concept of artists’ rights, the power of political protest and the ways in which iconoclasm offers a unique interpretation of society’s relationship to art and material culture. This compelling and thought-provoking study, now in B-format paperback and with a new preface by the author, forces us to rethink the ways in which we interact with art and its power to shock or subdue. Dario Gamboni is Professor of Art History at the University of Geneva. He has written widely in the field of art history, and his books include The Destruction of Art (1997), Potential Images: Ambiguity and Indeterminacy in Modern Art (2002) and Paul Gaugin: The Mysterious Centre of Thought (2014), all published by Reaktion Books.